Includes Ci4 diamond shaped insert. The unique diamond cutter shape on the Easy Detailer fits into tight places where cutters on other tools just won't fit. 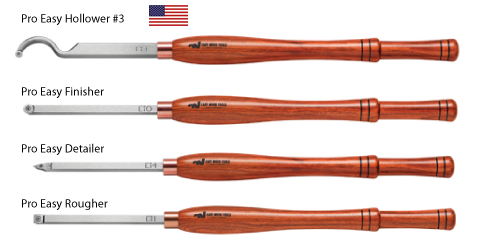 Offered here in the Pro-Series version, it has a rugged 1/2'' bar, massive 20'' hickory handle and an attractive copper ferrule. It is designed for small intricate work and cutting final details such as small coves and beads on both spindle and bowl work. It is also handy for cutting chuck tenons and making inside reverse angle cuts for inside chucking bowls with dovetail jaws. You may find they work well for hogging your green wood projects too. Made in USA.